» Gluten Free Daily Gluten Free Daily | Gluten Free Daily | Weight loss. Wellness. Fitness. Enjoying Thanksgiving dinner without hurting afterwards doesn’t have to feel like a sacrifice. You can partake in the festivities and walk away feeling great! A wonderful tradition my family and I have gotten into is signing up for a Turkey Trot or some kind of 5K walk or run on Thanksgiving morning. Get in a good workout and it’ll set the tone for the rest of the day. You’ll remember how hard you worked and it’ll help keep you from overindulging later. After that, refuel with a high protein breakfast. Maybe some eggs and gluten free toast and fruit or Steel Cuts oats with berries and protein powder or hemp seeds mixed in. Try snacking on some raw almonds or walnuts before you reach your destination. It’s best not to arrive hungry. If there are appetizers, maybe try a few bites and drink lots of water. When it’s time for dinner, serve yourself a small helping of the things you love. Again, drink lots of water while eating your meal. Try to eat slowly so as not to overeat. If you want to take it a step further and have a healthier dinner, try the turkey without gravy and lots of green veggies or salad (presuming they’re not loaded with cheese or salad dressing). The insides of a pumpkin pie make a great dessert as well. Thanksgiving doesn’t necessarily mean you need to leave with a stomach ache. Food is obviously a big part of the day but focus on the company and the meaning of the day and you’ll leave fulfilled. 1. Stick to the perimeter of the grocery store. Protein, fresh fruits and vegetables are much cheaper and healthier than the packaged goods in the middle. Packaged foods also tend to contain preservatives, and extra salt & sugar in order to make it last longer on a shelf. 2. Stick to Organic for mainly the “Dirty Dozen”. Produce such as strawberries, celery, spinach, cherries, tomatoes, sweet bell peppers, apples, nectarines, peaches, grapes, cherry tomatoes & cucumbers have been proven to contain a higher amount of pesticide residue. 3. Another great tip if you’re trying to save money is to rotate buying Organic versus Conventional. That way your body never gets too much of one thing. 4. Buy produce according to what’s on sale and in season. Buy extra and freeze it to have on hand for later. 5. Keep an eye out for grocery store sales and meal plan around that. Meal prep is key to making the most out of each item you buy. Often times, things are wasted because there was no plan for it. If you make salmon & roasted veggies one night maybe have it on a salad for lunch the next day or over brown rice pasta for dinner. Buy things with options in mind. 6. Pack your lunch instead of eating out. If you planned right you could spend $5 on meals for your whole day. You could spend $7-$10 just eating out at lunch, not to mention the added sodium. 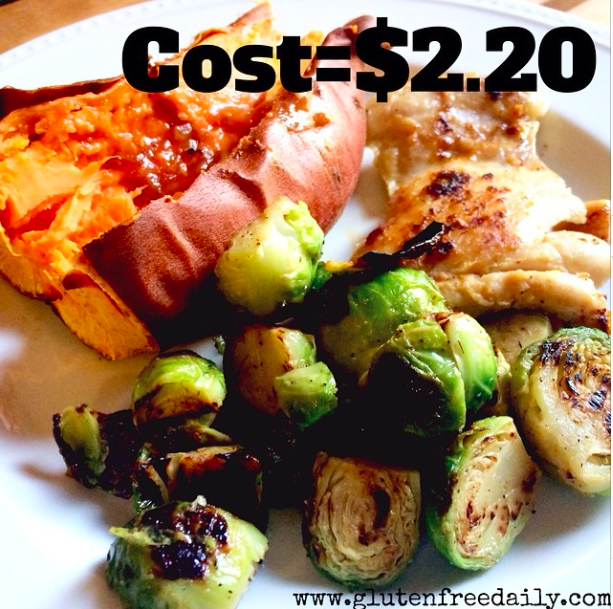 Eating healthy doesn’t have to be expensive. It just takes a little thought and planning. But it’s worth it to keep your body functioning at its absolute best! The following terms and conditions ("Agreement") govern the use of the GlutenFreeDaily.com Web site ("Site"). By accessing, browsing, or using this Site, you acknowledge that you have read, understand, and agree to be bound by these terms. If you do not agree to these terms, please do not use this Site. The information presented on this Website is in no way intended as medical advice or as a substitute for medical treatment. This information should only be used in conjunction with the guidance and care of your physician. Consult your physician before beginning any diet, nutrition, or fitness plan offered through the Website. Your physician should allow for proper follow-up visits and individualize your diet, nutrition, or fitness plan as appropriate. Nothing stated or presented on the Website is intended to be a substitute for professional medical advice, diagnosis, or treatment. Always seek the advice of your physician or other qualified health care provider if you have any questions regarding a medical condition, your diet, nutritional supplements, an exercise regimen, or any other matter related to your health and well-being. If you are pregnant, a nursing mother, anorexic, bulimic, or allergic to peanuts you agree not to participate in a Gluten Free Daily membership or program. If you are diabetic you agree not participate in any Gluten Free Daily program. If you fit into one of these categories and have already joined a program, please contact us immediately so that your membership may be terminated. If you do not agree to be bound by all of these Terms and Conditions, please do not use or access this Website. Gluten Free Daily reserves the right to refuse or cancel your membership due to certain medical conditions, including those listed above. We also reserve the right to cancel your membership should you violate any provision of these Terms and Conditions, or any other posted policy on the Website. The contents of this Website, including the text, graphics, images, and information obtained from GlutenFreeDaily’s third-party content providers, sponsors, suppliers, and licensors (collectively "Providers"), and any other materials are to be used for informational purposes only. You must be 18 years or older to purchase any product or service offered on or through the Website. Some of the content on the Website may not be appropriate for children. CHILDREN UNDER THE AGE OF 18 ARE NOT PERMITTED TO USE THIS WEBSITE. We are not spammers. We do not sell, transfer, or distribute your private information. By registering for one of our membership programs, you agree to opt-in to any email communications. When you visit the Website or send emails to us, you are communicating with us electronically. You consent to receive communications (including legal notices) from us electronically. We will communicate with you by email or by posting notices on the Website. You agree that all agreements, notices, disclosures and other communications that we provide to you electronically satisfy any legal requirement that such communications be in writing. GlutenFreeDaily may also deliver communications to you electronically. In addition, GlutenFreeDaily may deliver communications (including legal notices) to you at the street address provided in your GlutenFreeDaily membership account. Finally, GlutenFreeDaiy may deliver communications to you by any means set forth in any other GlutenFreeDaily policy or notice published on the Website. Unless otherwise noted, all materials, including images, graphics, illustrations, design, icons, photographs, data (including member data), text and other materials that are part of this Site (collectively, the "Contents") are copyrights, trademarks, and/or other intellectual properties owned, controlled or licensed to or by GlutenFreeDaily.com. This site as a whole is protected by copyright and trademark, all worldwide rights, titles and interest in and to which are owned by GlutenFreeDaily.com. GlutenFreeDaily.com grants you a limited license to access and make personal use of this site. You may not download (other than page caching) or modify any portion of our site, except with express written consent of GlutenFreeDaily.com. You may not use any part of this site for commercial or resale use; this includes, but is not limited to, logos, images, text, and data. You may not use data mining, robots, or similar data gathering and extraction tools. The contents of this site may not be reproduced, duplicated, copied, sold, resold, visited, or otherwise exploited for any commercial purpose without express written consent of GlutenFreeDaily.com. You may not frame or utilize framing techniques to enclose any trademark, logo, or other proprietary information (including images, text, page layout, or form) of GlutenFreeDaily.com without express written consent. You may not use any meta tags or any other "hidden text" utilizing GlutenFreeDaily.com's name or trademarks without the express written consent of GlutenFreeDaily.com. Any unauthorized use terminates the permission or license granted by GlutenFreeDaily.com. You are granted a limited, revocable, and nonexclusive right to create a hyperlink to the home page of GlutenFreeDaily.com so long as the link does not portray GlutenFreeDaily.com or its products and services in a false, misleading, derogatory, or otherwise offensive matter. You may not use any GlutenFreeDaily.com logo or other proprietary graphic or trademark as part of the link without express written permission. Please note that the permission granted herein terminates automatically if you breach any of these terms and conditions. Any other use of the Contents on this Site including reproduction for purposes other than as noted above, and including any reproduction, modification, distribution, or republication may violate copyright or trademark laws, and, without the prior written permission of GlutenFreeDaily.com, is strictly prohibited. Users of the Website (individually and collectively, "User") expressly agree that use of the Website is at User's sole risk. Neither GlutenFreeDaily, nor its employees or Providers, warrant that the Website will be uninterrupted or error-free; nor do they warrant or make any representation regarding the use of the information provided on the Website or the results that may be obtained from the use of the information provided on the Website, or as to the accuracy, reliability, or currency of any information, content, service, or merchandise provided through the Website. GlutenFreeDaily does not endorse, recommend, or sponsor and is not affiliated with any individuals or entities listed or linked to on the Website unless that fact is expressly stated. The listing of any individual or entity does not constitute a medical referral of any kind. Users are advised to exercise their own further informed review, judgment, and evaluation in the selection of any and all medical professionals and health information. THE WEBSITE IS PROVIDED BY GLUTENFREEDAILY ON AN "AS IS" AND "AS AVAILABLE" BASIS. GLUTENFREEDAILY MAKES NO REPRESENTATIONS OR WARRANTIES OF ANY KIND, EXPRESS OR IMPLIED, AS TO THE OPERATION OF THE WEBSITE OR THE INFORMATION, CONTENT, MATERIALS, PRODUCTS OR INDIVIDUALS INCLUDED OR LISTED ON THE WEBSITE. TO THE FULLEST EXTENT PERMISSIBLE BY APPLICABLE LAW, GLUTENFREEDAILY DISCLAIMS ALL WARRANTIES, EXPRESS OR IMPLIED, INCLUDING BUT NOT LIMITED TO, IMPLIED WARRANTIES OF MERCHANTABILITY AND FITNESS FOR A PARTICULAR PURPOSE. UNDER NO CIRCUMSTANCES SHALL GLUTENFREEDAILY OR PROVIDERS BE LIABLE TO YOU OR ANY THIRD-PARTY FOR ANY INDIRECT, CONSEQUENTIAL, INCIDENTAL, SPECIAL OR PUNITIVE DAMAGES, INCLUDING, BUT NOT LIMITED TO, LOST PROFITS AND BUSINESS INTERRUPTION, WHETHER IN CONTRACT OR IN TORT, INCLUDING NEGLIGENCE, ARISING IN ANY WAY FROM ANY PRODUCT OR SERVICE SOLD OR PROVIDED ON THE WEBSITE OR THE USE OF THE INFORMATION OR THE RESULTS OF THE USE OF THE INFORMATION PROVIDED ON THE WEBSITE, EVEN IF GLUTENFREEDAILY IS EXPRESSLY ADVISED OF THE POSSIBILITY OF SUCH DAMAGES. IN NO EVENT SHALL GLUTENFREEDAILY’S LIABILITY EXCEED THE PRICE YOU PAID FOR A PRODUCT OR SERVICE THAT IS THE SUBJECT OF THE CLAIM. NO ORAL ADVICE OR WRITTEN INFORMATION GIVEN BY GLUTENFREEDAILY, PROVIDERS OR THE LIKE, SHALL CREATE A WARRANTY; NOR SHALL USER RELY ON ANY SUCH INFORMATION OR ADVICE. Under no circumstances shall GlutenFreeDaily or any other party involved in creating, producing, or distributing the Website be liable for any direct, indirect, incidental, special, or consequential damages that result from the use of or inability to use the Website, including but not limited to the results from mistakes, omissions, interruptions, deletion of files or email, errors, defects, viruses, delays in operation or transmission, or any failure of performance, whether or not resulting from acts of God, communications failure, theft, destruction, or unauthorized access to the Website's records, programs, or services. User acknowledges that this paragraph shall apply to all content, merchandise, and services available through the Website. In those states that do not allow the exclusion or limitation of liability for consequential or incidental damages, liability is limited to the fullest extent permitted by law. The Website contains information, data, software, photographs, graphs, videos, typefaces, graphics, audio and other material (collectively "Content"). Regarding the Content supplied by Users or parties other than GlutenFreeDaily, GlutenFreeDaily is a distributor and not a publisher. GlutenFreeDaily has no more editorial control over such third-party or User Content than does a public library or newsstand. Any opinions, advice, statements, services, offers, or other information that constitutes part of Content expressed or made available by third parties and not by GlutenFreeDaily are those of the respective authors or distributors and not of GlutenFreeDaily. Neither GlutenFreeDaily nor any third party, including any Provider, or any User of the Website, guarantees the accuracy, completeness, or usefulness of any Content, nor its merchantability or fitness for any particular purpose. In many instances, the Content available through the Website represents the opinions and judgments of the respective Provider or User not under contract with GlutenFreeDaily.com. GlutenFreeDaily neither endorses nor is responsible for the accuracy or reliability of any opinion, advice, or statement made on the Website by anyone other than authorized GlutenFreeDaily employees. Under no circumstances shall GlutenFreeDaily be liable for any loss, damage or harm caused by a User's reliance on information obtained through the Website. It is the responsibility of a User to evaluate the information, opinion, advice or other Content available through the Website. User agrees to use the Website only for lawful purposes. User is prohibited from posting on or transmitting through the Website any unlawful, harmful, threatening, abusive, harassing, defamatory, vulgar, obscene, sexually explicit, profane, hateful, racially, ethnically, or otherwise objectionable material of any kind, including but not limited to any material that encourages conduct that would constitute a criminal offense, give rise to civil liability, or otherwise violate any applicable local, state, national, or international law or regulation. If GlutenFreeDaily is notified of allegedly infringing, defamatory, damaging, illegal, or offensive content provided by User, GlutenFreeDaily may investigate the allegation and determine in its sole discretion whether to remove or request the removal of such content from the Website. GlutenFreeDaily may disclose any content or electronic communication of any kind: (i) to satisfy any law, regulation, or government request; (ii) if such disclosure is necessary or appropriate to operate the Website; or (iii) to protect the rights or property of GlutenFreeDaily, its Users or Providers. GlutenFreeDaily reserves the right to prohibit conduct, communication, or content that it deems in its sole discretion to be harmful to individual Users, the Website, or any rights of GlutenFreeDaily or any third party, or to violate any applicable law. Notwithstanding the foregoing, neither GlutenFreeDaily nor its Providers can ensure prompt removal of questionable content after online posting. Accordingly, neither GlutenFreeDaily, nor Providers shall assume liability for any action or inaction with respect to conduct, communication, or content on the Website. The Website may reference or link to third-party sites throughout the World Wide Web. GlutenFreeDaily has no control over these third-party sites or the content within them. GlutenFreeDaily cannot and does not guarantee, represent or warrant that the content contained in these third-party sites is accurate, legal, or inoffensive. GlutenFreeDaily does not endorse the content of any third-party site, nor do we warrant that they will not contain viruses or otherwise impact your computer. GlutenFreeDaily does not assume any responsibility or liability for the actions, product, services, and content of all these and any other third parties. If you choose to link to or use a third-party website, you should carefully review such third party's privacy statement and other terms and conditions of use. By using the Website to search for or link to another third-party site, you agree and understand that you may not make any claim against GlutenFreeDaily for any damages or losses, whatsoever, resulting from your use of the Website to obtain search results or to link to another site. You agree to defend, indemnify, and hold GlutenFreeDaily and Providers harmless from and against any claims, actions or demands, liabilities and settlements including without limitation, reasonable legal and accounting fees, resulting from, or alleged to result from, your violation of these Terms and Conditions. Members can cancel their accounts at any time. You can cancel our program ANYTIME with absolutely ZERO cancellation fees. Canceling your account will stop your membership from automatically renewing after your current prepaid subscription is complete. If canceling in the middle of your prepaid membership, your access will still continue after your cancellation and you will not be reimbursed for the remainder of the membership period. To cancel an account, log on, go to "My Account", and under Subscriptions simply click "Cancel". GlutenFreeDaily.com occasionally offers a free trial period. If you sign up for our services and cancel your account before the free trial period expires, we will not charge a membership fee. To prevent this policy from being abused, you can take advantage of the free trial only once in a 12-month period. If you decide to keep your account, do not cancel after the free trial period. After your free trial period is complete and you have not cancelled, your account will automatically be converted to whichever membership you chose (weekly, monthly, quarterly or annually) and your credit card will be charged accordingly until your account is cancelled. The 5 Day Fat Flush and The True 28 programs are charged a one-time fee only. The full membership program is renewed monthly, quarterly (every 13 weeks), and annually every 52 weeks depending upon the program and billing cycle you select at time of order. You will be charged when you subscribe and at the beginning of each following membership period. The charge will be applied to the same account you provide at sign-up. You may cancel your membership at any time. If you cancel, billing stops immediately and no new charges will be billed to you. You will continue to have access to your account for the remainder of your term. Discounts are often offered. Since the memberships fees are automatically withdrawn, GlutenFreeDaily.com strongly recommends that members use credit cards that are not near their credit limit, which can increase the risk of incurring overdraft penalties. GlutenFreeDaily.com is not responsible for bank fees or penalties. Members are solely responsible for canceling memberships prior to renewal dates. Doll Enterprises, Inc. ("GlutenFreeDaily.com"), and/or any of its employees, do not accept or consider unsolicited ideas, including ideas for new advertising campaigns, new promotions, new or improved products or technologies, product enhancements, processes, materials, marketing plans or new product names. Please do not send any original creative artwork, suggestions, or other works. The sole purpose of this policy is to avoid potential misunderstandings or disputes when GlutenFreeDaily.com's products or marketing strategies might seem similar to ideas submitted to GlutenFreeDaily.com. So, please do not send your unsolicited ideas to GlutenFreeDaily.com or anyone at GlutenFreedaily.com. If, despite our request that you not send us your ideas, you still send them, then regardless of what your letter, fax, or e-mail says, the following terms shall apply to your idea submission. You agree that: (1) your ideas will automatically become the property of GlutenFreeDaily.com, without compensation to you, and (2) GlutenFreeDaily.com can use the ideas for any purpose and in any way, even give them to others. GlutenFreeDaily.com does, however, welcome your feedback regarding many areas of GlutenFreeDaily.com's existing business. If you want to send us your feedback, and we hope you do, we simply request that you send us an email to customerservice [at] GlutenFreeDaily.com. Please provide only specific feedback on GlutenFreeDaily’s existing products or marketing strategies; do not include any ideas that GlutenFreeDaily.com's policy will not permit it to accept or consider. It's just one more way that GlutenFreeDaily.com can learn how to best satisfy your needs. Any feedback you provide at this site shall be deemed to be non-confidential. GlutenFreeDaily.com shall be free to use such information on an unrestricted basis. The Website is created and controlled by GlutenFreeDaily in the State of California. As such, the laws of the State of California will govern these disclaimers, terms and conditions, without giving effect to any principles of conflicts of laws. GlutenFreeDaily reserves the right to make changes to its Website and these disclaimers, terms and conditions at any time. User hereby irrevocably and unconditionally consents to submit to the jurisdiction of the State of California for any litigation arising out of or relating to use of or purchase made through the Website (and agrees not to commence any litigation relating thereto except in such courts), waives any objection to the laying of venue of any such litigation in the California courts and agrees not to plead or claim in any California court that such litigation brought therein has been brought in an inconvenient forum. GlutenFreeDaily reserves the right to make changes to the Website, these policies, and these Terms and Conditions at any time, effective immediately upon the posting on this Website. Please check these Terms and Conditions periodically. If any of these terms and conditions shall be deemed invalid, void, or for any reason unenforceable, that term or condition shall be deemed severable and shall not affect the validity and enforceability of any remaining terms and conditions. These Terms & Conditions are the entire agreement between you and us relating to the subject matter herein. We may assign our rights and obligations under these Terms & Conditions. These Terms & Conditions will inure to the benefit of our successors, assigns, and licensees. The failure of either party to insist upon or enforce the strict performance of the other party with respect to any provision of these Terms & Conditions, or to exercise any right under the Terms & Conditions, will not be construed as a waiver or relinquishment to any extent of such party's right to assert or rely upon any such provision or right in that or any other instance; rather, the same will be and remain in full force and effect. 5 Day Fat Flush – Detox from processed foods! Resource Center – Find every solution! FREE Bonus!!! – 10 Week Meal Guide to maintain success! If you aren’t feeling better or don’t lose weight in 30 Days, we will give you back every cent! Get tons more helpful tips like these with a membership today! Over the next 28 days, it’s our goal to help you lose unhealthy weight and eliminate negative symptoms in connection to your previous diet. In this clean eating phase, we will reintroduce your metabolism to gluten free grains, red meat, some dairy, and natural sugars. Simply follow your plan, record recipes eaten in your journal, and SUCCEED! It’s that easy! UPDATE: EXTENDED DUE TO HIGH DEMAND THROUGH TODAY ONLY GET 50% OFF!! !